New Hebrides, an island group in the South Pacific now forms the nation of Vanuatu. The colony was administered as a condominium, a rare form of colonial territory in which sovereignty was shared by two powers, in this case Britain and France. The first British issues were Fiji Edward VII stamps overprinted for use on the islands. 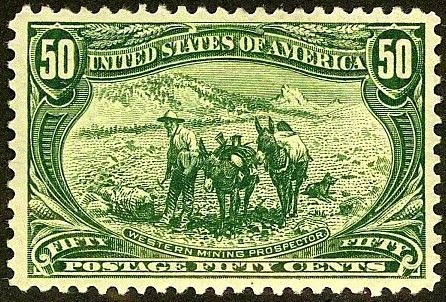 These were followed by the Native Idols stamps of 1911, some of which were surcharged over the next 13 years when certain denominations were in short supply. In 1924, three stamps were surcharged (Scott #38-40 ;Scott '14 CV for unused = $ 17.50). 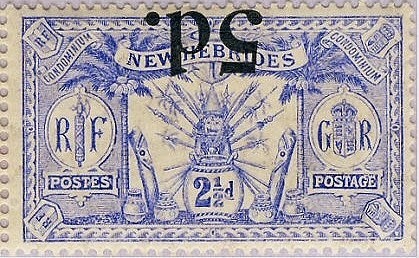 The scarcest of the values was the 5p on 2 1/2p Ultramarine (#39), of which 20,820 were issued. While this set is worth considering, there also exists a rare inverted surcharge (39a), which Scott '14 prices unused at $3,250.-. Quantities issued information is unavailable for this error, but I'm guessing that one or two sheets of 50 went through the overprinting machine upside-down. As with most rare overprinted issues, this stamp should be purchased conditional on obtaining expertization. The Republic of Vanuatu has about 100,000 citizens, so I think it unlikely that a significant collector population will develop there. 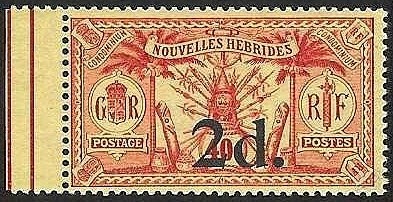 However, due to the former dual colonial administration, New Hebrides stamps appeal to both collectors of British Commonwealth and French Colonies.